Activity has been relatively low recently. The volcano observatory only reported weak to moderate explosions with ash plumes up to 500 m height above the crater. Strombolian activity remains at moderate unchanged levels. Ash plumes rose to 600 m above the crater and shock waves from stronger explosions rattle roofs and windows in houses of nearby villages. Activity at the volcano continued with little variation as intermittent strombolian explosions of small to moderate size. Incandescent material was ejected to about 100 m height and fell back to form glowing avalanches on the upper crater. Ash plumes rose to 400-700 m height and drifted for approx. 8 km before dissipating. Activity has decreased a bit. Strombolian explosions produced incandescent ejections to up to about 100 m and ash plumes rose to approx. 500 m.
The lava flow has disappeared and explosive activity in turn increased. The observatory reported ash plumes up to 600 m high and drifting SW to 8 km distance. Shock waves accompanied the stronger explosions. Rainfalls triggered a lahar in the Las Lajas river canyon. Explosive activity has been weaker recently, with pulses of strombolian explosions ejecting incandescent material to up to 100 m above the crater. Effusive activity continued to feed the lava flow towards Barranca Taniluyá. This morning, it was still about 100 m long. Activity increased at the volcano during Friday-Saturday. Near continuous mild to moderate strombolian explosions were observed and a new lava flow was erupted on the upper southern flank. Judging from the seismic signal, activity has decreased again today. The canyons that are most affected by lahars include the Santa Teresa, Taniluya, Ceniza, El Jute, Trinidad, and Las Lajas canyons, which are tributaries of the rivers Pantaleon, Achiguate, and Guacalate. Activity has remained at normal, but relatively high levels, characterized by intermittent small to moderately strong strombolian explosions at intervals ranging from 10 minutes to more than 1 hour. The strongest explosions eject abundant glowing material to 150 m above the crater and ash plumes up to near 1 km, and are usually accompanied by shock waves felt in several km radius. Ashfall was reported from the villages La Rochela, Ceilán and San Andrés Osuna. The explosions are often accompanied by loud rumblings and shock waves that rattled roofs and windows of houses in the villages Panimaché, Morelia, Santa Sofia and others in distances of up to 15 km around the volcano. Strombolian explosions at the summit vent have been weak and moderate, at typical levels, over the past days. The volcano observatory reported moderate to strong explosions with plumes up to 1 km height and drifting 12 km, causing ash falls ash on the villages Panimaché, Morelia, Santa Sofia and others. This activity was also accompanied by increased tremor. As of today, it has decreased again, but remains high, and the occurrence of another paroxysm is still a potential scenario. In this case, strong explosions and associated ash plum rising significantly more than 1-2 km above the summit, lava flows and potentially pyroclastic flows on the southern slopes could be expected. The volcano has returned to normal levels of activity without producing a new paroxysm when activity climbed during 10 April. Intermittent explosions of strombolian type and small to moderate size were heard during the past 24 hours, but could not be directly observed due to cloud cover. The increased rise of magma to the crater has been producing stronger and more frequent explosions, at averages of 8 per hour reported in last night's special bulletin of the volcano observatory. Seismic data also show an increase in tremor (internal vibration).  INSIVUMEH thinks that a new lava flow and / or another paroxysmal phase at the volcano could occur soon. The explosions at the volcano generated rumblings and shock waves that rattled ceilings and windows in villages Panimaché, Panimaché II, Morelia, Santa Sofia and others in the area at distances of more than 8 km. Strombolian activity at the volcano has decreased a bit. Weak to moderate explosions occur at irregular intervals typically in the range of 1 hour, eject abundant incandescent lava to 100-150 m above the crater and generate avalanches on the upper slopes. The lava flow has stopped being active. A small lava flow continues to be active on the upper SE slope of the volcano. Explosions have been a bit weaker on average, with incandescent lava ejected to 150 m and ash plumes reaching 500-800 m above the summit.